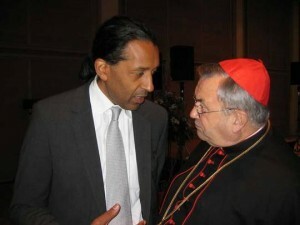 TV-News anchor Cherno Jobatey meets Karl Cardinal Lehmann, the chairperson of the German Bishop Conference. Jobatey asks him how he actually got the idea to research on the philosopher Heidegger. Karl Cardinal Lehmann’s dissertation topic: „The origin and sense of the existence question in the thinking of Martin Heidegger”. Karl Cardinal Lehmann elaborates on a very long answer to TV-News anchor Cherno Jobatey, telling him that news shouldn’t be everything. He should go more into philosophy. Heidegger might be a good start.